How on earth did we get to this point, when as recently as April 2014, both Carroll and Frederick Counties were under contract to build a 1,500 tons per day incinerator, and all the necessary permits had been issued? Many people worked for several years, first to try to block this project from gaining the necessary approval, and subsequently to stop it once it had. As a resident of Carroll County, my role began in the summer of 2009, shortly after our Board of Commissioners agreed to partner with Frederick with a 40% stake in the financing, construction and operation of the planned facility. At first, knowing little about the terrible downsides from an environmental and destruction of resources standpoint, burning our trash to make electricity seemed like a reasonable idea. I knew landfills had problems – my home of almost thirty years is about a mile from one. However, once a handful of us learned the details about the process and the intricacies of the agreement, we realized this was a horrific future for our residents. 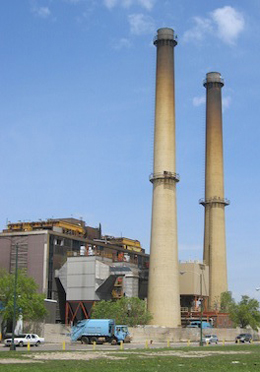 Fortunately Frederick County already had a group opposing the incinerator, so we met with them, and we adopted some of their strategies as well as co-opting their name – and Waste Not! Carroll was born. We were anything but sophisticated in those early days and a bit naïve, too. A good friend with a lot more experience than I have at such endeavors was very supportive of our efforts, but he remarked we didn’t stand a chance! 1) Know your facts and work hard to educate your community. We were blessed with qualified volunteers who could analyze the myriad of contracts as well as address the significant environmental and social concerns. Once we had built a convincing case, we took it to the public any way we could. We spoke at schools, churches and civic groups; we started a website; we set up an information table every weekend at a local farmers’ market; and we wrote letters to the editor. Eventually, we became recognized as the local voice for all things ‘trash’. 2) Build a broad coalition. Nothing replaces a good grassroots network. For those of you who aren’t aware, Carroll County is very conservative. If we had been viewed as strictly an environmental group, we would never have succeeded. Early on, we reached out to some local conservative groups for support, based on our evidence that this project was going to cost taxpayers considerably more than advertised. This move proved to be key – not only did our membership grow, but it eventually opened doors politically that otherwise might have remained closed. 3) Finally, we felt it essential that our group be FOR something, not just AGAINST the incinerator. We needed to offer a viable alternative to what we were fighting, and that alternative became the concept known as Zero Waste. For several years, Waste Not! 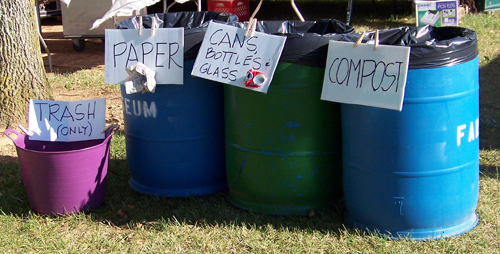 Carroll volunteers have setup ZW zones at two local events, Common Ground Roots Music Festival and the Maryland Wine Festival, and demonstrated to thousands of people that discards and organic food-scraps are resources, not necessarily mindless trash. Looking back, I am proud of what we were able to accomplish together – our current Board of Commissioners in Carroll County voted on Earth Day 2014 to withdraw from the contract which set in motion the events that led to Frederick’s decision last Thursday – but there is still so much left to be done! When people ask me why, I tell them I did it for my children. Yes, they will get to live incinerator-free, but they also got to witness what hard work and cooperation can achieve for the greater good. As all three of them are in their twenties now, each has developed a unique social consciousness and civic activism – not necessarily mine, but theirs. Now that is victory in my book! Don has been active in Carroll County environmental issues for many years. He helped co-found the Maryland Heartland Sustainable Living Fair (now Sustainable Living Maryland), he co-found Waste Not! Carroll (trash advocacy) and most recently the Green Business Network. He has lectured widely on issues in solid waste, the environment, green building and sustainability. He runs a small construction company, is an adjunct faculty member at Carroll Community College, and lives outside of Westminster on a farm with his wife, three children (not so much anymore) and menagerie of other assorted critters, including their Dromedary camel, Lancelot.